The solution-based synthesis of the coordination polymer, CuTCNQ (TCNQ = 7,7,8,8-tetracyanoquinodimethane), which exists in two phases, has predominately used acetonitrile (MeCN) as the solvent. However, our knowledge on the growth and properties of CuTCNQ in other solvents remains limited. In this work, the synthesis of CuTCNQ on Cu foil in two protic (MeOH, EtOH) as well as four aprotic (MeCN, DMSO, DMF, THF) solvents has allowed us to obtain new insights into the important role of the reaction medium in the spontaneous crystallization of CuTCNQ in discrete morphologies and phases. A new electrochemical method for phase identification also has been developed to support this study. Findings reveal that (i) the solvents with higher dielectric constants favor CuTCNQ crystallization; (ii) irrespective of the solvent, use of high temperature (60 °C vs. 25 °C in conventional synthesis) promotes CuTCNQ crystallization and facilitate conversion of phase I to phase II; (iii) phase I CuTCNQ possess enhanced redox catalysis (ferricyanide reduction by thiosulfate) performance over phase II CuTCNQ; and (iv) the amount of catalyst is not necessarily the most important factor for driving catalytic reactions, and other factors, such as, morphology, redox characteristics and solvent in which the CuTCNQ is synthesized may dictate the overall catalytic performance. These findings emphasize the importance of understanding the influence of parameters, such as, solvent and temperature in CuTCNQ synthesis as a means of providing materials with improved catalytic activity. The online version of this article ( https://doi.org/10.1007/s42247-019-00026-8) contains supplementary material, which is available to authorized users. The ambipolarity, superconductivity, and a myriad of interesting properties of charge transfer (CT) complexes based on 7,7,8,8-tetracyanoquinodimethane (TCNQ) have seen significant interest in exploring these materials for new applications [1, 2, 3]. As such, a number of strategies based on electrochemical [4, 5, 6, 7, 8, 9, 10, 11, 12, 13, 14], vapor deposition [6, 14, 15, 16, 17, 18, 19, 20], and wet chemical routes [21, 22, 23, 24, 25, 26, 27, 28, 29, 30, 31] have been employed to fabricate these materials. A large body of work in this area has focused on MTCNQ [9, 25], as the strong electron withdrawing ability of neutral TCNQ (TCNQ0) from a metal (M0) allows a wide breadth of MTCNQ (M+TCNQ−) materials to be fabricated with relative ease [8, 9, 25]. The unique electronic properties of these metal-organic CT complexes have allowed them to be used in field emission and molecular electronics [9, 32]. 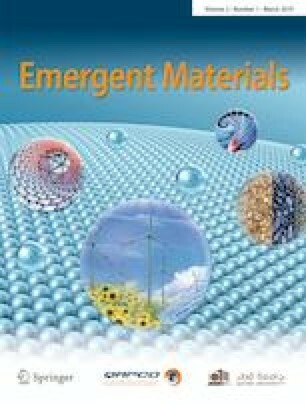 Our group and others have been able to recently expand the applicability of these materials beyond the field of electronics [7, 16, 17, 21, 22, 23, 24, 26, 27, 28, 29, 30, 31, 33, 34, 35, 36, 37, 38]. Some examples include, nanoarrays of CuTCNQ, AgTCNQ, CuTCNQF4 (2,3,5,6-Tetrafluoro-7,7,8,8-tetracyanoquinodimethane), AgTCNQF4, CuTCNQ/AgTCNQ hybrids, CuTCNQ/noble metal hybrids, and AgTCNQ/noble metal hybrids as excellent photocatalysts [21, 24, 25, 26, 27, 28, 31, 39]; CuTCNQF4/Ag hybrids as redox catalysts ; heterojunctions of CuTCNQ/ZnO as a humidity sensor ; alkali-TCNQ nanoarrays as gas sensors [16, 17]; AgTCNQ nanowires as an antibacterial material ; Fe(TCNQ)2, Mn(TCNQ)2, and Co(TCNQ)2 as electrocatalysts for oxygen and hydrogen evolution reactions [33, 34, 38, 41], and CuO/TCNQ and Co(OH)2/TCNQ nanoarrays on copper foams as electrocatalysts [42, 43, 44]. These wide-ranging possibilities using MTCNQ materials have seen renewed interest to improve their fabrication strategies. Since the initial report on MTCNQ materials by Melby et al. , much of the effort in the synthesis of these materials has focused on solution-based or vapor deposition strategies. Of these, the former is preferred as it only requires simple immersion of a metal foil in an acetonitrile (MeCN) solution containing TCNQ0 [9, 25]. The ease of reduction (strong electron withdrawing ability) of TCNQ facilitates its spontaneous reaction with many metals, resulting in the formation of MTCNQ on the surface of metal foil [9, 25]. Although this strategy is simple and robust, it poses certain limitations in controlling the aspect ratio, the overall morphology and the phase of the resulting MTCNQ structures. Since these factors can significantly influence the properties of MTCNQ, there is a strong motivation to explore alternative fabrication strategies. Specifically, in the context of CuTCNQ, our group recently developed two independent approaches to control the aspect ratios of the resulting CuTCNQ microrods. In the first strategy, we employed a bi-solvent approach where the addition of small quantities of water to MeCN allowed dynamic control over the reaction kinetics in favor of CuTCNQ crystallization, leading to microrods of ≈ 100 μm in length, instead of 5–10 μm achieved through conventional synthesis . In another approach, we could overcome the equilibrium barrier using a recycling strategy, where the replenishment of the reaction solution with fresh TCNQ0(MeCN) over multiple cycles favored CuTCNQ crystallization, allowing the formation of ≈ 70 μm long microrods . In most studies, a polar aprotic solvent, typically MeCN, has remained the preferred reaction medium for CuTCNQ growth. Notably, CuTCNQ is known to exist in two distinct phases (phase I and phase II) [9, 45, 46]. During its synthesis in MeCN, phase I is formed under ambient conditions, while phase II is typically observed at elevated temperatures . Given that the choice of the solvent and the synthesis temperature can have a large influence on the reaction kinetics and reaction equilibrium [47, 48], it is important to understand the influence of these parameters on the morphology and the phase of CuTCNQ. In line with the above considerations, this work is focused on the investigation of the crystallization and growth of CuTCNQ in a range of polar solvents at 25 and 60 °C. To obtain a detailed understanding of the role of solvent and temperature on CuTCNQ crystallization, we also synthesized phase-pure CuTCNQ using well-established methods . These materials served as reference standards for the characterization of CuTCNQ formed in this study (Fig. S1, Supporting Information). The study of CuTCNQ crystallization in a range of solvents provides an in-depth understanding of factors involved in modulating the crystallization kinetics. The outcomes reveal that the CuTCNQ crystallization kinetics, their morphological characteristics and phases are significantly influenced by (i) the nature of the solvent (protic vs. aprotic, dielectric constant and dipole moment) and (ii) the reaction temperature. Importantly, it was discovered that the morphology of CuTCNQ has a major influence on the catalytic activity. However, the catalytic efficiency of morphologically distinct CuTCNQ materials was independent of the amount of CuTCNQ crystallized. Copper foil (99% pure), potassium ferricyanide, copper (I) iodide (Cu2I2), DMSO, DMF, ethanol, methanol, THF, sodium thiosulfate, and copper sulfate were purchased from Sigma Aldrich, Australia. 7,7,8,8-tetracyanoquinodimethane (TCNQ) was purchased from Chem Supply, Australia. MeCN was purchased from Ajax Fine Chem, Australia. All chemicals were used as received. Deionized water was dispensed from a Millipore Milli-Q Ultrapure Water system fitted with Organex-Q Cartridge filters. To remove surface oxides, before the growth of CuTCNQ, the copper foil was treated with dilute nitric acid, washed with deionized water, and dried with a flow of nitrogen immediately prior to use. A 1.0 × 1.0 × 0.50 cm3 piece of Cu foil was placed in contact with 5 mM TCNQ dissolved in the solvent of interest. The reaction between Cu foil and TCNQ in each solvent was allowed to proceed for 24 h at 25 °C or 60 °C. Subsequently, the Cu foils were washed with the relevant solvent to remove any unreacted TCNQ from the surface. These substrates were used for materials characterization and catalysis. Pure phase I and II CuTCNQ were synthesized using a literature method . Phase I CuTCNQ was formed by a redox reaction between TCNQ (hot solution dissolved in MeCN) with Cu2I2 . This reaction resulted in the formation of phase I CuTCNQ, which was precipitated, then washed with MeCN. Phase II CuTCNQ was obtained by prolonged stirring of a suspension containing the phase I CuTCNQ in MeCN at room temperature . The Cu foils containing CuTCNQ grown in different solvents were characterized by a range of methods. Instrumental techniques used for this characterization are as follows: a FEI Verios 460L FE-SEM instrument operated at an accelerating voltage of 10 kV; EDX analysis with a FEI Verios 460L FE-SEM instrument coupled with EDX Oxford X-Max Silicon Drift Detector; FTIR spectroscopy with a Perkin–Elmer D100 spectrophotometer in attenuated total reflectance mode with a resolution of 4 cm−1; Raman spectroscopy with a Perkin–Elmer Raman Station 200F at an excitation wavelength of 785 nm and 100 μm spot size. A BASi Epsilon-EC electrochemical workstation was used for voltammetric experiments. A glassy carbon (GC) working electrode was first prepared by polishing it with 0.3 μm alumina (Buehler, Lake Bluff, IL, USA) on a clean polishing cloth (Buehler, USA), followed by washing several times with deionized water under sonication for 5 min. The GC electrode was finally washed with acetone and dried under a N2 stream before modification with the CuTCNQ sample. The CuTCNQ samples grown on Cu foil were collected by scraping from the Cu foil surface using a spatula. These CuTCNQ samples, as well as phase I and II reference standards were loaded onto the GC (0.00786 cm2) macro-disc electrode. Pt wire was used as a counter electrode and Ag/AgCl (3.0 M KCl) was used as a reference electrode in a 3-electrode cell. An aqueous 0.10 M CuSO4.5H2O solution was used as a solvent and supporting electrolyte medium. The presence of Cu2+ in the aqueous electrolyte minimizes the dissolution of the solid from the CuTCNQ-modified electrode upon repetitive cycling of the potential . Given that the Cu2+ is reduced at potentials more negative than 0.200 V, the electrochemistry of CuTCNQ adhered to a GC electrode in contact with 0.10 M CuSO4 was studied over the potential range of 0.250 to 0.600 V. Samples for electrochemical studies were prepared freshly as prolonged immersion of the CuTCNQ-loaded GC electrode in aqueous Cu2+ electrolyte solution facilitated the conversion of phase I to phase II. All experiments were performed in triplicate. The ferricyanide reduction reaction was used as a model pseudo-first order reaction to test the catalytic efficiency of CuTCNQ samples grown in different solvents and temperatures. A 30 mL solution was used for the catalytic reaction in the presence of visible light. The reaction contained 1.0 mM ferricyanide, 0.10 M thiosulfate, and CuTCNQ catalysts grown on Cu foil (1.0 × 1.0 × 0.50 cm3). Care was taken to maintain the temperature of the reaction at 25 ± 1 °C under stirring at 1200 rpm using a magnetic stirring bar. The catalytic conversation of ferricyanide to ferrocyanide was monitored as a function of time using UV-vis absorbance spectroscopy (Cary 50 Bio spectrophotometer). 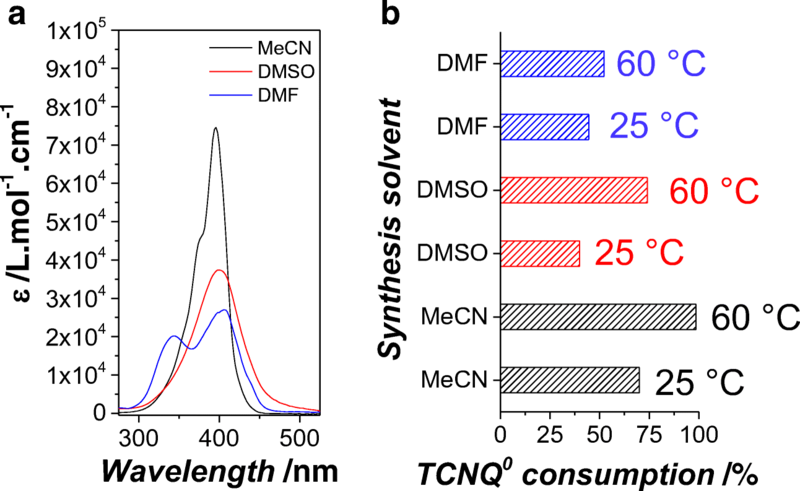 In MeCN, the synthesis of CuTCNQ proceeded via a one electron transfer reaction between Cu0(metal) foil and TCNQ0(MeCN) resulting in the spontaneous crystallization of phase I CuTCNQ microrods on the surface of the Cu foil (24 h at 25 °C). In accordance with the previous reports, these microrods showed faceted corners with 1–4 μm diameters (Fig. 1a and Fig. S2, supporting information) [9, 25]. If the synthesis of CuTCNQ in MeCN is performed at lower temperature (8 °C for 24 h), the reaction significantly slows down, but does not markedly alter the morphology of the CuTCNQ crystals (Fig. S3, supporting information). Conversely, if the CuTCNQ crystallization is performed at higher temperatures (24 h at 60 °C), an obvious change in morphology is observed (Fig. 1b and Fig. S4, supporting information). Two discrete CuTCNQ populations are noted. The predominant one exhibits larger structures which results from the merger of the smaller microrods (minor population) formed at ambient temperature. This increase in the diameter to 50–100 μm in the major population is a characteristic of phase II CuTCNQ . Based on these observations, further studies were focused on comparing the CuTCNQ crystallization at 25 °C and 60 °C. To understand the influence of the solvent on CuTCNQ crystallization and growth, we chose four aprotic (acetonitrile, dimethyl sulfoxide, dimethylformamide, and tetrahydrofuran) and two protic (ethanol and methanol) solvents (Table 1). 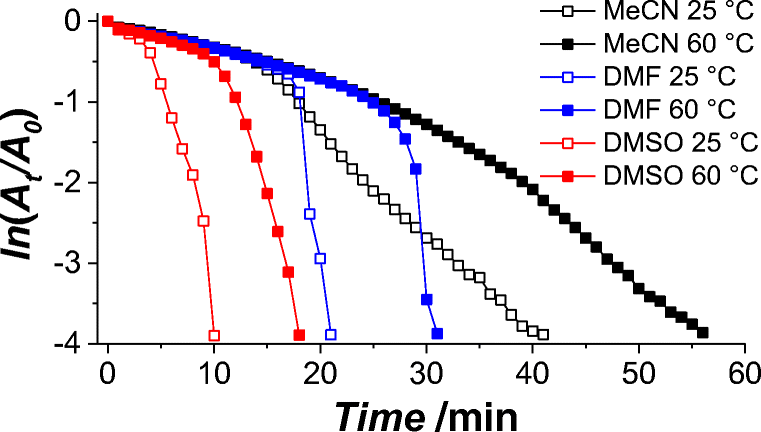 When the Cu0(metal) foil was exposed to TCNQ0(solution) dissolved in different solvents, it was visibly obvious that the nature of the solvent plays an important role in CuTCNQ crystallization (Fig. S5, supporting information). With the exception of THF, all aprotic solvents crystallized CuTCNQ on the Cu foil surface (foil turned bluish-black). In contrast, the color of the Cu foil did not change when the protic solvents were used. Based on the properties of the solvents which induced CuTCNQ crystallization, we suggest that the dielectric constant and/or dipole moment of the solvent has a major influence on the spontaneous reaction between Cu and TCNQ. For example, the CuTCNQ crystallization was observed in solvents with high dipole moments and dielectric constants, such as DMSO (3.96 D/47.24 Fm-1), MeCN (3.92 D/36.64 Fm-1), and DMF (3.82 D/36.7 Fm-1). In contrast, THF with a low dipole moment and dielectric constant (1.75 D/7.52 Fm-1) failed to crystallize CuTCNQ. This suggests that polar aprotic solvents with lower dielectric constants may not have sufficient driving potential to crystallize CuTCNQ. This observation supports our previous finding that introduction of small amounts of water, a high dielectric medium (1.85 D/80.1 Fm-1) in MeCN significantly promotes CuTCNQ crystallization . Since only DMSO, MeCN and DMF showed visual evidence of CuTCNQ crystallization, further studies were confined to these solvents. Figure 2 and Figs. S6–S9, supporting information, show the morphological characteristics of CuTCNQ grown using TCNQ0 dissolved in DMSO or DMF at 25 °C or 60 °C. At 25 °C, when the reaction was carried out in DMSO, cylindrical rod-like structures appear perpendicular to the surface of the Cu foil. Although these morphological characteristics are similar to those seen in MeCN (Fig. 1a), the packing density of the rods is significantly higher (Fig. 2a and Fig. S6, supporting information). In the case of DMF, at 25 °C, a rod-shaped morphology is observed (Fig. 2c and Fig. S8, supporting information). However, in contrast to the discrete rod-like morphology observed in MeCN (Fig. 1a), the rods in DMF are fused. This results in small cube-like appearance of these structures, more apparent at lower magnifications. These fused rods are of 2–4 μm in diameter and 6–10 μm long. It is noted that the microrods typically observed in MeCN under ambient conditions are 0.5–2 μm in diameter and less than 10 μm in length [25, 26, 27, 28, 29, 30, 31]. If the reaction is carried out at 60 °C, in DMSO, the morphology changes from rod-like to very thin plate-like structures with an edge thickness of less than 100 nm (Fig. 2b and Fig. S7, supporting information). In DMF, two distinct morphologies, viz., a minor population of rod-like structures, dominated by 60–80 μm long and 15–20 μm wide platelets, is observed (Fig. 2d and Fig. S9, supporting information). These morphologies distinctly differ from those observed in MeCN during conventional synthesis (Fig. 1). A plausible explanation for this morphological change may be attributed to solvent-dependent surface tension. It is well known that during epitaxial growth, the morphology of the resultant particles depends on parameters such as, temperature, atomic flux, and the surface tension of the medium. In particular, an increase in the surface tension typically leads to the formation of smoother surfaces [50, 51]. In this work, the surface tension increases in the order MeCN < DMF < DMSO. This implies that the surface tension plays an important role in creating smoother and thinner CuTCNQ crystals in DMSO. Energy dispersive X-ray (EDX) spectral analyses of the CuTCNQ crystals formed in different solvents show characteristic energy lines corresponding to C Kα (0.277 eV) and N Kα (0.392 keV) [25, 26, 30, 31] that are assigned to the presence of TCNQ− in CuTCNQ (Fig. S10, supporting information). In addition, the expected energy lines corresponding to Cu Kα and Cu Kβ are observed [25, 26, 30, 31]. The absence of an O Kα signal confirms minimal oxidation of Cu in all cases. An elemental EDX map establishes that the growth of CuTCNQ remains uniform under all experimental conditions (Fig. S11, supporting information). The chemical identity of the CuTCNQ crystals was further assessed using Raman and Fourier-transform infrared (FTIR) spectroscopy (Fig. 3). In particular, Raman spectroscopy can differentiate between neutral TCNQ0 and the radical TCNQ− anion in CuTCNQ [22, 26, 27, 28, 29, 30, 31]. Raman spectra (Fig. 3a) obtained from CuTCNQ grown under different conditions were background corrected using an in-house developed smoothing-free algorithm . All CuTCNQ samples contained TCNQ−, as evident from the red shift in the Raman bands assigned to the C−CN wing stretch (1380 cm−1 in TCNQ− vs. 1450 cm−1 in TCNQ0) and the C≡N stretch (2200 cm−1 in TCNQ− vs. 2225 cm−1 in TCNQ0) [22, 26, 27, 28, 29, 30, 31]. Additional bands corresponding to the C=CH bending (1200 cm−1) and C=C ring stretching (1600 cm−1) confirm the presence of the TCNQ− anion. These shifts in the Raman bands occur because TCNQ coordinates with Cu through its nitrile group [22, 26, 27, 28, 29, 30, 31]. The absence of TCNQ0 bands proves that TCNQ0 from solution does not directly crystallize either on the surface of the Cu foil or CuTCNQ. The phase of the CuTCNQ cannot be distinguished by Raman spectroscopy alone, as evident from the Raman spectra of phase-pure CuTCNQ in Fig. S1f (supporting information). Thus, the phase was assessed using FTIR spectroscopy (Fig. 3b and c and Fig. S1g and h, supporting information). All FTIR spectra including the phase-pure CuTCNQ (Fig. S1g) showed the δ(C–H) bending vibrations at ca. 823 cm−1, as expected from TCNQ− in CuTCNQ, negating the possibility of TCNQ0 or TCNQ2− (Fig. 3b) [22, 26, 27, 28, 29, 30, 31]. However, the band at ca. 2200–2215 cm−1 can be used to identify the phase, such that phases I and II show bands at ca. 2200 and ca. 2215 cm−1, respectively (Fig. S1h, supporting information) [39, 45]. An additional band at ca. 2170 cm−1 is noted in all the samples; however, it is more prominent in phase II. FTIR spectral analysis reveals that irrespective of the solvent, the CuTCNQ grown at 25 °C shows characteristics of a phase I material (Fig. 3c). However, if grown at 60 °C, predominantly phase II material with a minor residual phase I is produced (Fig. 3c), consistent with the morphological characteristics of these materials described earlier (Fig. 1). This implies that during the synthesis of CuTCNQ at 60 °C, CuTCNQ first crystalizes as phase I and converts to the thermodynamically stable phase II. The observation of the solvent-dependent, temperature-induced phase change mimics the behavior previously deduced from cyclic voltammetry, where conversion of the kinetically-favored phase I to the thermodynamically-favored phase II occurs even under ambient conditions . Electrochemistry may therefore offer a superior approach to distinguish the two phases of CuTCNQ. On this basis, we have developed a method using electrochemical solid-solid state interconversion for precise identification of the phases of CuTCNQ. The underlying concept exploits the fact that microparticles of TCNQ0 adhered to a glassy carbon (GC) electrode in contact with aqueous 0.1 M CuSO4 can be reduced to form CuTCNQ via reaction (1) . Under voltammetric conditions, the kinetically-favored phase I CuTCNQ is first formed electrochemically in the initial cycles of potential but is then transformed to the thermodynamically-stable phase II on extensive, repetitive cycling of the potential. Therefore, in this voltammetric method of phase identification, if the material under investigation is phase I CuTCNQ, making the initial scan direction positive, starting from 0.400 V vs. Ag/AgCl, followed by repetitive cycling of the potential, over the range of 0.600 to 0.250 V, leads to conversion to phase II, in aqueous solution containing Cu2+(aq). Alternatively, if a phase II material is adhered to a GC electrode, insignificant changes in its voltammetry on repetitive cycling is expected. If both phases co-exist, then the voltammetric response is expected to contain features of both phases. Experimentally, this concept is validated in Fig. 4, using reference standards pristine phase I (Fig. 4a), phase II (Fig. 4b), and a mixture of these phases (Fig. 4c). The synthesis of the pure materials is elaborated in the experimental section [10, 45]. For pristine phase I CuTCNQ, an oxidation peak at 479 mV, the reverse of Eq. (1) and a companion reduction peak at 285 mV (Eq. 1) are observed (Fig. 4a). The large separation of ~ 194 mV in the peak potentials, the shape and other characteristics are consistent with an electrochemically irreversible solid-solid interconversion that occurs by a nucleation growth process, as described in detail in the literature . Thus, phase I is easier to oxidize than phase II CuTCNQ where both these processes occur via an overall two-electron oxidation process giving Cu2+(aqueous) and TCNQ0(solid) . Multi-cycling of the potential of this phase I material progressively causes solid-solid conversion of phase I to phase II CuTCNQ. This conversion is clearly evident after the 10th and subsequent cycles, when a distinct, alternative process, associated with the oxidation of phase II emerges at more positive potential, at the expense of phase I. In contrast, the cyclic voltammetry for pristine phase II CuTCNQ gives an initial oxidation peak directly at a more positive potential of 493 mV (Fig. 4b) than that observed for phase I. For this phase, multi-cycling of the potential does not lead to a significant change in the peak potential. Next, if a mixture containing pristine phase I and II is analyzed by cyclic voltammetry (Fig. 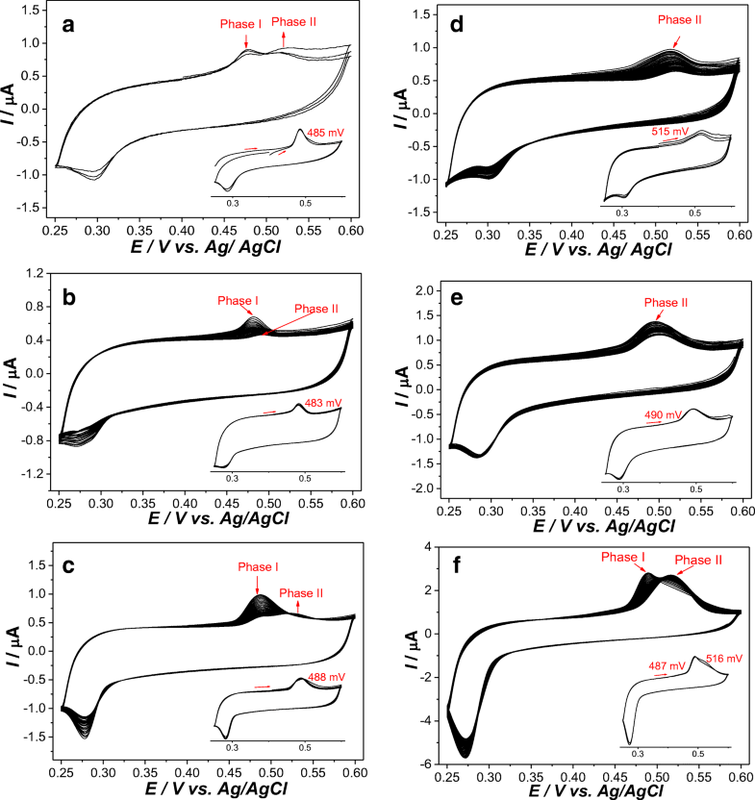 4c), two distinct oxidation peak potentials are observed, and multi-cycling of potential resulted in an increase in the current magnitude of the more positive potential peak corresponding to phase II at the expense of the phase I peak. This pattern of behavior is as expected for a sample that contained a mixture of both phases. It should be noted that for phase analysis of CuTCNQ, the first cycle is not used due to its unique properties and complexities in solid-solid state electrochemical interconversion, restricted to the first cycle [9, 10]. The samples synthesized in different solvents were analyzed by the electrochemical method validated above (Fig. 5). For CuTCNQ synthesized at 25 °C in MeCN (Fig. 5a), DMSO (Fig. 5b), and DMF (Fig. 5c), multi-cycling clearly shows the conversion of phase I to phase II via progressive phase transition. This unambiguously confirms that the CuTCNQ synthesized at 25 °C only contained phase I. For the CuTCNQ synthesized at 60 °C, voltammetry is cycle-independent in case of MeCN (Fig. 5d) and DMSO (Fig. 5e), confirming the formation of phase II, predominately in these solvents. The synthesis in DMF, however, reveals a mixture of the two phases (Fig. 5f), which we previously assigned as phase II based on FTIR spectroscopy. Comparison of our electrochemical characterization tool for phase identification with conventional FTIR spectroscopy (Fig. 3c) reveals that where FTIR is not be sufficiently discriminative to resolve admixtures of different phases, electrochemistry offers enhanced capabilities. To obtain further mechanistic insights into the influence of solvent on CuTCNQ crystallization, we performed UV–vis absorbance studies and probed the consumption of TCNQ0 during CuTCNQ synthesis (Fig. S12, supporting information). The absorption characteristics of a chemical species is strongly influenced by the surrounding medium. Thus, to compare the solvent-dependent CuTCNQ crystallization, we calculated the extinction coefficients (ε) of TCNQ0 in each solvent (Fig. 6a). It is important to note that the λmax value for TCNQ0 is slightly solvent-dependent (396, 398, and 404 nm in MeCN, DMSO and DMF, respectively). Using the ε values at λmax, the amount of TCNQ0 consumed during each reaction could be calculated. This provides us with the reaction kinetics of CuTCNQ crystallization relevant to each solvent (Fig. 6b). The analysis of the UV-vis spectra reveals that CuTCNQ crystallization is promoted at higher temperatures, and the solvent plays a large influence on the degree of crystallization. It is also noted that at 25 °C, the degree of CuTCNQ crystallization is lowest in DMSO. To assess the catalytic ability of CuTCNQ materials prepared as described above, we employed a model pseudo-first order redox reaction involving the reduction of ferricyanide to ferrocyanide in the presence of excess thiosulfate ions as shown in Eq. (2) [25, 26, 30, 31]. This process is readily monitored by absorbance spectroscopy by measuring the change in λmax at 420 nm (ferricyanide). 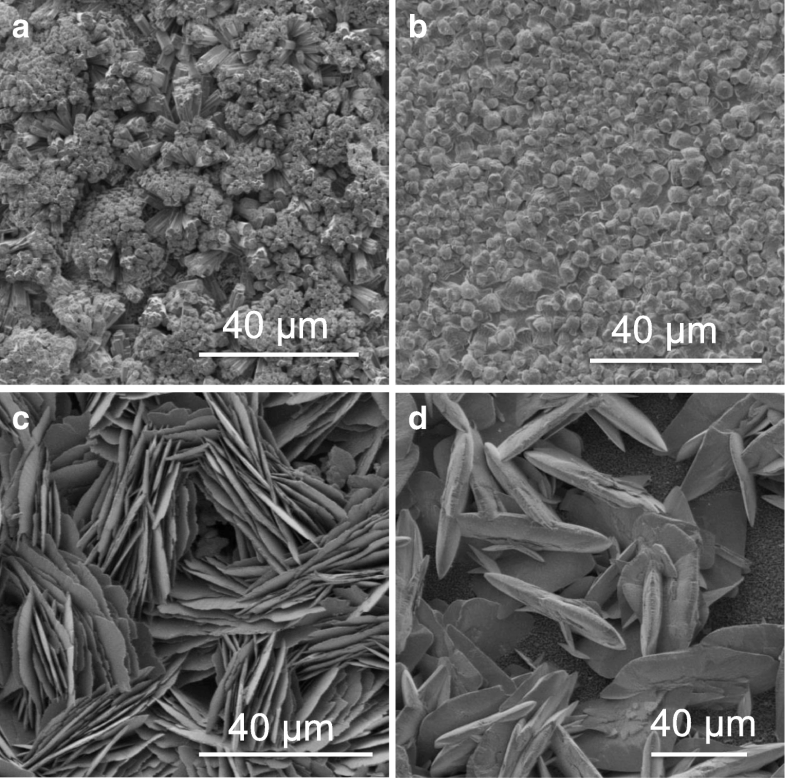 Although the amount of CuTCNQ catalyst was not constant, the physical size of the Cu foil on which the active catalyst was grown was kept consistent (1.0 cm × 1.0 cm) for all catalytic studies. Figure 7 and Fig. S13 (supporting information) reveal that all samples exhibit an ability to reduce ferricyanide, albeit with different efficiencies. Firstly, the catalysts prepared in the conventional solvent MeCN show significantly less activity than those prepared in DMSO and DMF. Secondly, in all cases, the catalytic performance of CuTCNQ grown at 60 °C is lower than those grown at 25 °C. For example, the time taken for the reaction to go to completion using DMSO and DMF catalysts prepared at 60 °C (predominantly phase II) took 18 and 31 min, respectively. In contrast, the catalysts grown at 25 °C (predominantly phase I) in the same solvents showed superior performance, taking 10 and 21 min, respectively. This corresponds to an improvement of 44% and 32% in catalysts prepared under ambient conditions over those grown at 60 °C in DMSO and DMF, respectively. Overall, this suggests that phase I CuTCNQ displays better catalytic performance than phase II. This is not surprising as the conductivity of phase I is considerably superior to that of phase II [9, 25, 39], which is expected to result in better electron transfer ability in the case of the former. While it is difficult to calculate the number of active sites in case of each catalyst, based on the amount of CuTCNQ crystallized on the surface of the Cu foil, these results suggest that CuTCNQ grown in DMSO (25 °C) provides the best catalytic performance. The plots of the ln of the ratios of the reactant at time t (At) and that at initial time point (A0) vs. reaction time allowed us to calculate the apparent reaction rate, kapp from the slope of the linear fits (Table 2) [9, 25, 39]. Interestingly, CuTCNQ catalysts show an induction time (or lag time) before the reaction starts to display pseudo-first order kinetics. It is widely believed that the occurrence of an induction time is due to the faster reactivity of the electron donor with the dissolved/adsorbed oxygen than with the key reactant . We have previously established that in the case of CuTCNQ prepared in MeCN, the dissolved oxygen adsorbed on the surface of the CuTCNQ led to an induction time during catalysis . Interestingly, this induction time can be tuned through synthesizing CuTCNQ in different solvents. The induction time follows the solvent order MeCN > DMF > DMSO. In all solvents, the induction time for phase II CuTCNQ is significantly larger than that for phase I, revealing that kinetically-favored phase I CuTCNQ is a better redox catalyst. In summary, this work provides new insights into the important role of the reaction medium in the spontaneous crystallization of CuTCNQ on the surface of Cu foil. Changing the solvent can have important implications on the morphological characteristics of CuTCNQ. While polar aprotic solvents typically have the ability to crystalize CuTCNQ, we note that solvents with higher dielectric constant can favorably drive CuTCNQ crystallization. Further, irrespective of the solvent, the elevated temperatures not only promote CuTCNQ crystallization, the conversion of phase I to phase II is simultaneously favored. To extend the phase identification resolution capabilities available with FTIR, we have also introduced a robust and more sensitive technique based on electrochemical solid-solid state interconversion. While the amount of catalyst used in a reaction is typically considered important for driving a reaction, we observe that the catalyst with the lowest amount of CuTCNQ (DMSO/25 °C) outperformed all other materials with least induction time. These results outline the importance of understanding the influence of simple synthesis parameters such as solvent and temperature that can induce morphological and phase changes during CuTCNQ crystallization. Combining the outstanding redox capabilities of the new CuTCNQ materials reported here with optically-tunable two-dimensional (2D) materials [53, 54, 55, 56, 57, 58, 59, 60, 61] will offer opportunities for developing new photo-redox catalysts. V.B. thanks the Australian Research Council (ARC) for a Future Fellowship (FT140101285). V.B., R.R., L.L.M., and A.M.B. acknowledge the ARC for funding this project though an ARC Discovery (DP170103477) Grant. The authors are appreciative of the generous support of the Ian Potter Foundation towards establishing the Sir Ian Potter NanoBioSensing Facility at RMIT University. R.R. acknowledges RMIT University for a Vice Chancellor Fellowship. Authors acknowledge the support from the RMIT Microscopy and Microanalysis Facility (RMMF) for technical assistance and providing access to characterization facilities. V.B. : Australian Research Council (ARC), Future Fellowship (FT140101285). V.B., R.R., L.L.M., A.M.B. : ARC, Discovery Grant (DP170103477).